Being a gladiator warrior in ancient Rome, typically mean’t your life expectancy was much lower than that of a typical Roman citizen. The job of a gladiator by it’s very nature mean’t putting your life on the line with every battle. You might be mortally wounded and killed instantly or wounded and your life would now be out of your hands. With each match your chance of survival would lessen, and it was typical to fight in 2 or 3 times a year. If a gladiator survived a few years they were doing well, with many gladiators not making it past four years fighting. This married up with many gladiators being able to buy their freedom after three to five years of fighting. This would roughly work out to around 10 fights as the point at which many gladiators would not pass. Age was also another factor to consider for the average age of a gladiator, with 30 being the point your chances of survival lessening greatly. Research has actually been done on headstones relating to Roman gladiators and an average age is considered to be 27, although likely many more died younger and were not even given headstones. The gladiators stand before their fights, unsure if their life will end today. If a gladiator was to lose, and be in danger of his life being ended, he could request Missio, which was to request that the organiser of the games grant them their life. sine mission literally meaning ‘without release’ and the gladiators would battle to the death.Sine Missione was to have a gladiator match agreed before hand to go to the final blow. Pollice verso literally meant ‘thumb turned’ and would go to the crowd to determine whether this gladiator was deemed worthy to survive. With thumb down or to the side it is thought that gladiators life would be ended. Stans missus means to ‘leave standing’ meaning that if they lost they could be granted reprieve and allowed to leave the arena alive. Liberation was the freeing of a gladiator from fighting, meaning they would be awarded the rudis and allowed to retire from fighting should they wish, enjoying the life of a free man. Pugnare ad digitum means ‘fight to the finger’ which roughly equates to a gladiator raising their finger, hand or arm to look for reprieve from death. If a gladiator was bested or seriously injured, knowing the fight would end with them dying, they could essentially give up officially and look for mercy. 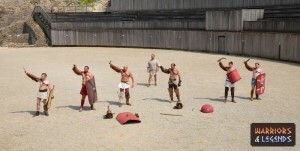 It was likely that a gladiator willing to request his life continue should have a longer run and a longer life, depending on the leniency of the game organisers. 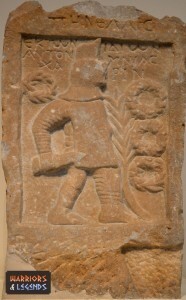 A grave stone of a gladiator. The short life of a gladiator could still mean a impressive grave. To be a gladiator was not a long term career and typically gladiators did not live to ripe old ages. To be a gladiator was to fight for the money, fame and glory, maybe even the love of the fight. But to retire and live to an old age, was not the common theme among gladiators.